Do you want to make a really cool snow globe? 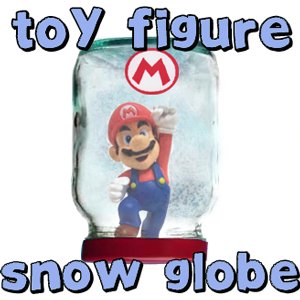 Find a figurine that you don’t play with any more and use that to make a really cool snow globe. This is also a great way to keep a special toy figures on display. 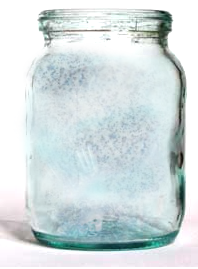 Find out how to make this super cool snow globe with a baby food jar (or any old jar). – (Optional) Acrylic Paint and Paint brush to paint the outside of the jar. Firstly, wash the jar and cap and dry them both off. 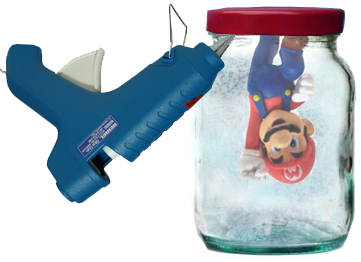 Then take your toy figurine and hot glue it to the baby jar’s lid (Let Mom or Dad Do This Part). Now fill the jar with water and sprinkle in the glitter of your choice. (Let Mom or Dad do this part) Put glue onto the cap and then close the lid tightly on to the jar. Then Seal the jar by gluing all around the edge. 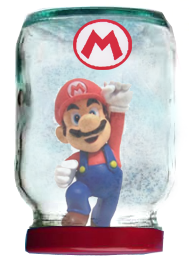 This is what your Snow Globe should look like now. You can then paint (optional) whatever you want to on this snow globe. 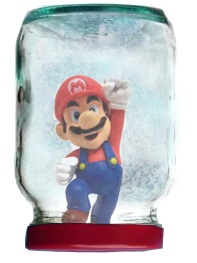 Since my snow globe is a Super Mario Snow Globe, I put the Mario logo on the jar. I hope that you had a great time and that your snow globe turned out fantastically. You can also add a few drops of ivory soap dish soap to give the liquid a pearly accent. Don’t know if it will work in plain water, but does work if you put it into water & food color to make swirly pearlescent colored water/shake the bottle & it swirls around. (it’s been a long time but this struck a memory). can you you use mineral oil intend of water to make the snow fall or do u haft to use water??????????? To tell you the truth, I’m not sure…but I don’t see why you couldn’t use mineral oil. Let me know what happens if you try it. You should use distiller water and then add a few drops of glycerin to the water, it makes the snow fall slowly instead of just sinking. You buy it at the drug store.